Reflexology massage is a theory and therapy that uses the feet to treat the whole body. By massaging and applying pressure to certain parts of the feet known as reflex areas, other corresponding and connected areas of the body will feel the benefit. 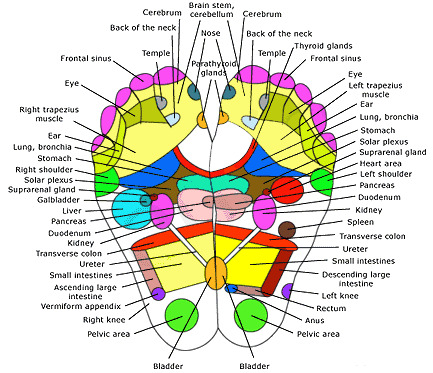 In reflexology the feet are like mini-maps of the body’s anatomy so any body system can be accessed and stimulated by massaging and manipulating the corresponding area of the foot. The aim is to stimulate the body’s own healing processes in order to keep it in homeostasis (balance). Reflexology massages encourage both relaxation and stimulation: the first helps the body rebuild its energy resources and recover from illness and disease whereas the second helps activate the circulation and nervous system, making bother more efficient and benefiting the body as a whole. The treatment lasts 1 hour and is carried out in a lying down or reclined position. The recipient is asked to remove their socks and shoes but otherwise remains fully clothed throughout the treatment. The treatment involves light, but firm, compression massage to the soles and uppers of your feet.